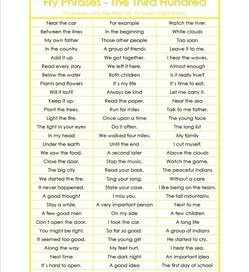 The Fry phrases you’ll find here are appropriate for kindergarten through fifth grade. Each set has 81 to 90 commonly used phrases, many of which are easily recognizable as part of our everyday vocabulary. 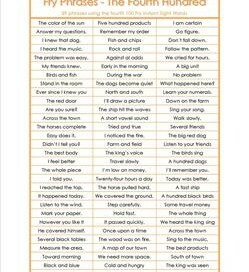 Check out the description for each set of phrases to see which Fry word list most of the words come from. Some phrases contain more than one Fry word. Most are not complete sentences. 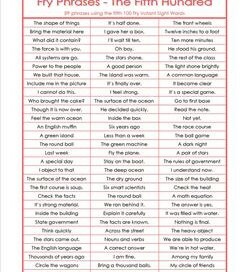 Example phrases are: “Get on the bus”, “Answer my questions”, “The force be with you”, and “I can’t do it”. 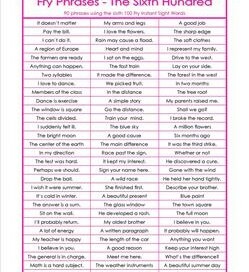 Fry Phrases – The Second 100 lists 90 phrases or short sentences using the second 100 words from the Fry words list. Examples: Where in the world? and It’s only me. 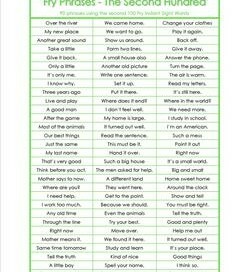 Fry Phrases – The Third 100 lists 90 phrases using the third 100 words from the Fry words list. Examples include: between the lines, in the beginning, and Close the door. 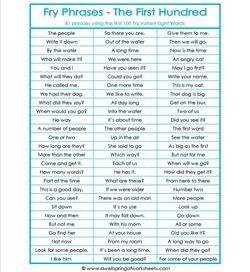 Fry Phrases – The Fourth 100 lists 89 phrases or short sentences using the fourth 100 words from the Fry words list. Examples: early in the morning, cold and hungry, black and blue.